On-trend inn restaurant serving local Long Island fare. 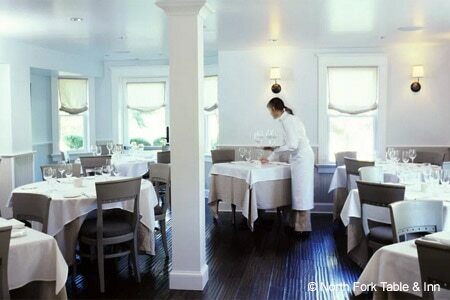 : The North Fork Table & Inn's food is on-trend in more ways than one. Menus are created with an eye to Long Island's local and seasonal produce, and special ingredients like house-made bacon-infused vodka in Bloody Marys and house-cured bacon show the establishment’s attention to detail. Tasting lineups at lunch and dinner are a great way to get to know the cuisine and associated wine pairings. Dishes tend to be mainstays that one frequently sees on New American menus in the region: Long Island duck is cooked according to taste and served with lentils and root vegetables; striped bass from Long Island Sound comes with clams and the intriguing accompaniment of shrimp sausage. Other little touches indicate the restaurant's desire to attract hip clientele, including the offering of half-batches of freshly baked cookies to take home and the food truck situated in the parking lot in the summer season, serving up quick, tasty lunch options every day of the week. Wine and cheese selections are a nod to area talent. In the dining room, in classic Hamptons style, shades of white, beige and eggshell create a brightness that is offset by the dark, rich hardwood floors.